The Oase Pondovac 4 is New for 2016 and incorporating the latest Oase Aquatic Technology with 20% more power than its predecessor the Pondovac 3. 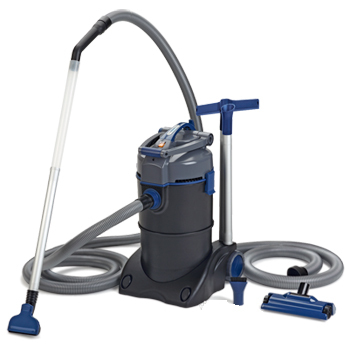 The Oase Pondovac 4 is capable of vacuuming down to depths of 2.4 metres. Also the NEW Oase Pondovac 4 achieves non-stop cleaning avoiding annoying stop/start container emptying, like some of its inferior competitors and the old Pondovac 2. Powerful 1700 watt motor and optimised turbine enables greater suction power to a max depth of 2.4m (nearly 8ft). Large diameter casters and generous handle ensure that the Pondovac can be easily moved around the garden. Includes a special string algae nozzle, a wide area nozzle with a rubber lip, a new brush nozzle and a versatile floor nozzle with adjustable aperture, as well as a fine mesh debris collection bag for the water return. Accessory 'tidy' facility that means all the tools can be organized and stored easily. Also excellent for cleaning swimming pools and wet vacuuming floors in the house and patio tiles. The Oase Pondovac 4 avoids the annoyance of container capacity restrictions, allowing the pond to be vacuumed constantly. The difference is the non-stop clean! Good pond maintenance is an essential requirement for keeping healthy fish. We carry a selection of pond maintenance products to help keep your pond clean and healthy. The excellent Oase Pondovac 4 is a top of the range pond vacuum, easy to use and ideal for large and small ponds. The improved Oase Pondovac 4 is now even better and more reliable. Oase Pondovac 4 is a sludge vacuum cleaner which can remove particles of dirt, algae, string algae, sludge, dead vegetation and bits of leaves. This new version of the tried and tested Oase pond o vac makes pond maintenance even quicker and easier. Keeping the pond floor clean and free of unsightly floor sediment, sludge, and plant remains is necessary, and unfortunately it is often quite tiresome. Now this is no longer the case! The new generation of pond vacuum cleaner – We don’t give it a rest! Two identically sized cylinders are filled and emptied in alternating cycles. If one container is full then a valve is mechanically activated by a float. This triggers emptying of one and at the same time allows the other cylinder to be filled. This is how both vacuuming and emptying of the container can occur at the same time! The Oase Pondovac 4 has Built-in wheels which allow for easy movement and transportation. The scope of delivery includes a special string algae nozzle, a wide nozzle with a rubber lip, a crevice tool and a floor nozzle, the vacuum tube extension, as well as a debris collection bag for the water return. It is also ideally suited for wet vacuum implementation in the household. It saves precious time, facilitates pond cleaning, and guarantees a perfect result.